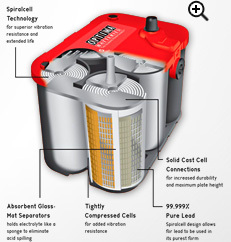 Why use an Optima Battery? 1. Optima Batteries are shipped FREE of charge! 5. All Optima batteries are shipped fully charged. The OPTIMA RedTop battery delivers high power cranking ability commonly used in trucks, SUV's, luxury cars, hot rods, and off-road vehicles. The OPTIMA BlueTop battery is available as a starting or deep cycle battery for marine and RV applications. The OPTIMA YellowTop is Dual-Purpose,designed for engine start and cyclic applications and for use in vehicles with large accessory loads.